One of the most familiar and friendly faces amongst the BTCC paddock, Max Coates is set to return to the Ginetta GT Supercup at his local circuit, Croft this weekend. 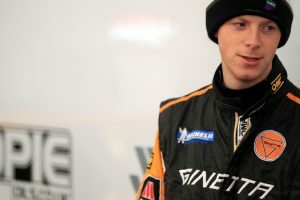 On the back of a dominant performance by Nathan Freke at Oulton Park in the newly rebuilt Ginetta G55 where the former G50 champion took a double victory, Coates is aiming to emulate this performance at his local circuit. “I’m really excited to be back in the car and want to show everyone what I’m capable of. Hopefully I can repeat Nathan’s success from Oulton Park,” said Coates. Century Motorsport Team Principal Nathan Freke expressed his delight at Max returning to the team. “Everyone at Century Motorsport is delighted to have Max back in our car. Having run with us in Brands Hatch at the end of last season, we know what he’s capable of and that matched with his local circuit knowledge at Croft should mean we could see him earn a good result.